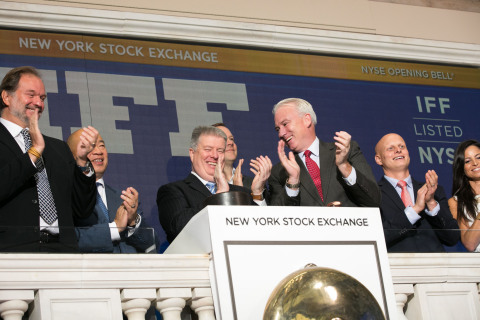 International Flavors & Fragrances Inc. (NYSE and Euronext Paris: IFF) announced today that members of its senior management team rang the New York Stock Exchange (NYSE) Opening Bell® today, October 8, 2018, at 9:30 a.m. Eastern Daylight Time to celebrate the completion of IFF’s combination with Frutarom, creating a global leader in taste, scent and nutrition. Provides strong value creation opportunities to maximize shareholder value – including cross-selling benefits as well as cost synergies. International Flavors & Fragrances Inc. (NYSE:IFF) (Euronext Paris: IFF) is a leading innovator of scent, taste, and nutrition, with over 110 manufacturing facilities, 100 R&D centers, and 33,000 customers globally. At the heart of our company, we are fueled by a sense of discovery, constantly asking “what if?”. That passion for exploration drives us to co-create unique products that consumers experience in more than 150,000 unique products sold annually. Our 13,000 team members globally take advantage of leading consumer insights, naturals exploration, research and development, creative expertise, and customer intimacy to develop differentiated offerings for consumer products. Learn more at www.iff.com, Twitter, Facebook, Instagram, and LinkedIn.